It’s char grilled, it’s salty, it’s lemony, this dish is a refreshing start to the summer and pairs nicely with a tasty steak on the Barbie. Heat gas grill or stove top grill to high. Coat asparagus with 2 tbsp. of oil and a couple of pinches of salt. 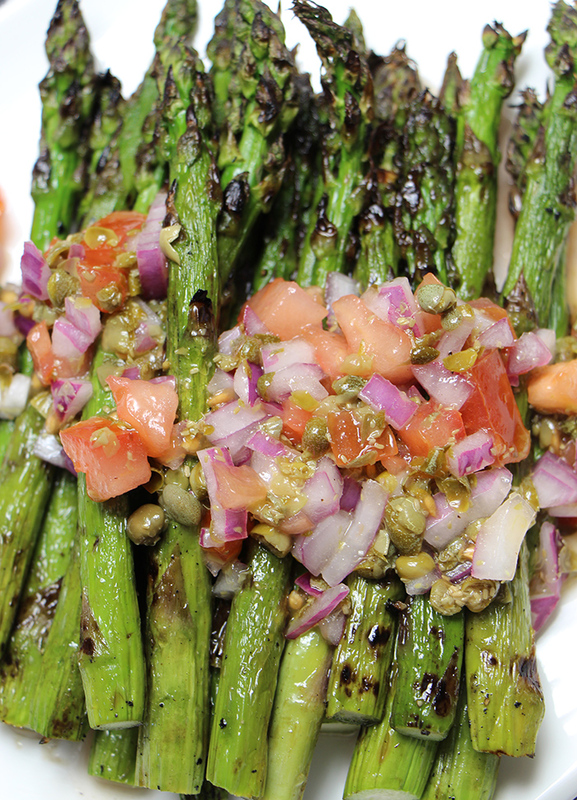 Grill asparagus until charred in spots and bright green. This should take about 4 minutes. Remove from grill. Wisk remaining 8 tbsp. of extra virgin olive oil, lemon juice and vinegar in a large bowl. Add capers, parsley, tomato, and onion. Season with salt and pepper to taste. Pour over the asparagus as it comes off the grill and serve!